We’d love your help. Let us know what’s wrong with this preview of The Afterwards by A.F. Harrold. Ember and Ness are best friends, completely inseparable. Ember can't imagine what life would be without Ness. Until Ness dies, in a most sudden and unexpected way. Ember feels completely empty. How can From the acclaimed team behind The Imaginary comes another powerful, poignant, and darkly fantastical story about friendship, perfect for fans of Neil Gaiman and Roald Dahl. To ask other readers questions about The Afterwards, please sign up. w o w children's books are depressing these days. no but seriously this was extraordinarily sad. It's about a little girl named December (who is hereafter referred to by a ton of nicknames to confuse us all) whose best friend (Happiness) dies and then December finds her way into the afterlife (literally getting lured there by a mega creepy uncle) to get her back. See?? this is so so sad. I guess it's intended for kids who've lost someone, but it was really chilling when we had half-dead dogs runn w o w children's books are depressing these days. no but seriously this was extraordinarily sad. It's about a little girl named December (who is hereafter referred to by a ton of nicknames to confuse us all) whose best friend (Happiness) dies and then December finds her way into the afterlife (literally getting lured there by a mega creepy uncle) to get her back. See?? this is so so sad. I guess it's intended for kids who've lost someone, but it was really chilling when we had half-dead dogs running around and December finds her mum in the afterlife and her mum is like clawing and sobbing and begging December to die and stay with her. 0_0 Also it doesn't actually address the super creepy uncle luring December away and putting her in danger (shout out to kids that your relatives can be bad). Also I feel a bit off that Happiness is black and died. I always am skeptical when the only minority character in a book is dead. I can see how this book might be comforting to kids trying to deal with something so horrible in thier lives, but at the same time I can't see how it helps!? I guess the point is for December to move on and say goodbye, but wow, I sobbed over Bridge To Terabithia as a kid and this one I just closed feeling vaguely unsettled. December and happiness are best friends and they live next door to each other. But one sad day one of them dies from a accident, the whole school is very sad by the passing of their school mate, even more so is the girl who's bestfriend died, she feels lost and alone. One day after school the uncle comes to take the girl home to his place. He has a special key and a map and they go out the back gate and keep turning left till they find a house. The uncle has taken them to the Afterwards, a place in which the dead go to wait and their she finds her dead friend. She is soon taken back to the real world, the uncle shouldn't have used her as a swap to get his dead dog back. The girl comes up with a plan to rescue her friend and bring her back from the dead. I am a Christian and this is not the afterlife I want, this afterworld was a depressing very grey place, where all was lost. Colleen Fauchelle leslie hamod wrote: "So sad and touching. Great review!😘"
All in all this was not what I had hoped for from this duo who delivered one of my most favourite of MG books. It felt contrived and forced. It was a little too dark in places, and doesn't really deliver the message it seems the creators were going for. In theory this would be a good book to help kids work through loss, but in practice not so much. Also, why was there no comeuppance for the guy who wanted to trade the life of his niece in order to bring his dog back to land of th Review to come. Also, why was there no comeuppance for the guy who wanted to trade the life of his niece in order to bring his dog back to land of the living? December lives at home with her caring father, Harry. There's just the two of them since mum died many years ago and although dad has a partner who cares deeply for 'Ember', December's time, love and thoughts are always with her best friend, Happiness who loves the same things she does and is in the same class as her. More of an 'equal' than a sequel to The Imaginary, this remains a dark and haunting world but this, for me, is a different story. Yes, there is a sense of creepiness about the plot December lives at home with her caring father, Harry. There's just the two of them since mum died many years ago and although dad has a partner who cares deeply for 'Ember', December's time, love and thoughts are always with her best friend, Happiness who loves the same things she does and is in the same class as her. More of an 'equal' than a sequel to The Imaginary, this remains a dark and haunting world but this, for me, is a different story. Yes, there is a sense of creepiness about the plot and characters but what Harrold is sharing here is a story about facing and accepting loss. How he does this is quite profound and brave and one that I think children could get so much out from. I don't know of any other children's author out there who is willing to tackle these sensitive subjects and do it with so much care. Coupled with some more stunning illustrations from Emily Gravett this is one of the most tender books you'll ever have the pleasure to read. The book deals with a friendship so strong that even after death there is still a bond between the girls. From the write-up you know that one of them is going to die, but you aren't prepared with how sudden it was, you then ge I don't know of any other children's author out there who is willing to tackle these sensitive subjects and do it with so much care. Coupled with some more stunning illustrations from Emily Gravett this is one of the most tender books you'll ever have the pleasure to read. The book deals with a friendship so strong that even after death there is still a bond between the girls. From the write-up you know that one of them is going to die, but you aren't prepared with how sudden it was, you then get to see through Ember's eyes how adults deal with death, from the parents not knowing how to deal with a grieving child to Ember not fully understanding what has happened, it makes for some moving scenes. Once Ember reaches the afterworld that is where Emily's illustrations come into their element. I was amazed by her artwork in The Imaginary and am amazed again, those little bits of colour really stand out, and when things start to get creepy her drawings do not disappoint. My daughter was lucky enough to win a signed copy of this, just before her birthday and it has been added to her small collection of books that she's never gonna let go of. It doesn't matter if you don't have kids, as an adult you will still get plenty out of this book, and I dare you not to cry. This review has been hidden because it contains spoilers. To view it, click here. Just finished reading this fantastic book by A.F Harold! After reading the Imaginary (and loving every aspect of it) I was so excited to read the Afterwards. I found this book incredibly moving and it was not what I expected at all! I think Harold dealt with the feelings of loss and grief (especially for a young child) in such a brilliant way. I loved how the introduction of December (Ember) mirrored that of the introduction of Amanda Shuffleup in the Imaginary, with their different approach to Just finished reading this fantastic book by A.F Harold! After reading the Imaginary (and loving every aspect of it) I was so excited to read the Afterwards. I found this book incredibly moving and it was not what I expected at all! I think Harold dealt with the feelings of loss and grief (especially for a young child) in such a brilliant way. I loved how the introduction of December (Ember) mirrored that of the introduction of Amanda Shuffleup in the Imaginary, with their different approach to the shoes as a subtle way of telling the audience these are two very different characters. The relationship between Ember and her dad, referred to as Harry, interested me. I felt the way she referred to him as Harry possibly highlighted a sort of distance between the two. Yet Harold made it clear they loved one another deeply and this was expressed through less conventional means - Ember knows Harry cares for her and would do anything for her and doesn't need this to be stated to her. There are continual references to Ember acknowledging that Harry would do anything for her if she asked. However, I felt on some occasions (her walking home from school alone so soon after loosing her friend) that she shouldn't need to ask. I did like the way these characters were multi-dimensional, it made them more realistic as nobody is perfect. I felt the connection between Ember and Happiness (Ness) was more genuine and real than the friendship between Rudger and Amanda in the Imaginary - maybe because they were two real people. This made Ness' death more tragic, it really shocked me and was completely unexpected. The introduction of Uncle Graham, to me, felt more sinister to that of Mr Bunting (the Imaginary) largely due to the circumstances of his introduction. Ember is alone, he approaches her in an alley way and lures her back to his house, made even more disturbing with the snippets of dialogue from the phone call from (assumedly) Harry. The fact that she was alone in an alley way instantly highlighted her vulnerability, whereas Amanda was in her visit with her mother upon her first encounter with Mr Bunting. Uncle Graham's entire demeanour was sketchy and instantly made me nervous of his intentions, the revelation that he was her uncle did little to sway my opinion - if anything it made it worse! I had more 'puzzles' and maybe dislikes after reading this novel than the Imaginary. I wanted to know what happened to Uncle Graham after he left the house, understand more about his motivations or character. I was also puzzled by the character of the Mother and felt that the situation turned from a heartfelt moment to something much more sinister. It felt unnatural to me that a mother would not encourage her child to go and live, rather than stay in the 'world of grey' with her. Another character that puzzled me was Ms Todd - I felt we never understood who she was or her role in the story and the other world. The cat hinted there was more too her character but this was never resolved. Overall, I throughly enjoyed this novel. When it ended I was disappointed, I wanted to continue reading - maybe in the hope of having some of my questions answered but more importantly to know what happened next in Ember's life. I think some of the topics covered in this book could be too mature or upsetting for younger children however it is definitely a book I would consider using with an older class of children. I think the themes of friendship, love and loss could easily relate to many different people, adults and children alike. I would definitely recommend this book to others. I liked the characters, especially December and Harry. I really adore their bonding as father-daughter. The story line has great pacing and development. I loved how the author describes December and Happiness' friendship. I think we would all be like December if we were ever to lose our best friend. However, the 'other world' for the dead could be more solid, in my opinion. Overall, it was heartfelt and beautifully written. I read A.F. Harrold's The Imaginary back in 2014 and enjoyed it so I thought I'd pick up another children's book from this author. The Afterwards brings together the same author/illustrator combination which works really well in terms of storytelling. This book had darker elements that reminded me of Neil Gaiman's children's fiction but was quite an emotional read. It is a story about life and death, remembering and letting go. The only thing I didn't enjoy was the repetitive nature of the story I read A.F. Harrold's The Imaginary back in 2014 and enjoyed it so I thought I'd pick up another children's book from this author. The Afterwards brings together the same author/illustrator combination which works really well in terms of storytelling. Well, this was interesting, intense, and very sad. It was unsettling at times. Some things I downright didn’t like, specially the idea of death being when you are forgotten and turn to dust. The Afterwards is sad and depressing, and I think if I had read this as a child, I would feel anxious. What I liked most were the illustrations and different ways to present text. But I am not a fan of this sad story... I like books that leave me thinking and wondering and hopeful. This one left me unsettled Well, this was interesting, intense, and very sad. It was unsettling at times. This is a story about December, a girl whose best friend, Ness, dies. When she finds a way into the "afterworld", she hatches a plan to bring Ness back into the real world. Overall, this book didn't reach more than a "it was ok" rating for me. December is kind of an idiot to think she can go wandering around and messing with the afterlife with no consequences. In this part of the afterlife, things (animals, people) who die stay around while they "forget" themselves. When they've been dead long en This is a story about December, a girl whose best friend, Ness, dies. When she finds a way into the "afterworld", she hatches a plan to bring Ness back into the real world. Overall, this book didn't reach more than a "it was ok" rating for me. December is kind of an idiot to think she can go wandering around and messing with the afterlife with no consequences. In this part of the afterlife, things (animals, people) who die stay around while they "forget" themselves. When they've been dead long enough to have forgotten they were alive, they turn to dust. (view spoiler)[December goes back one too many times and ends up "dead". Ness inevitably turns to dust, so her objective (to rescue Ness) is foiled. December seeing her mum who's been hanging around in the afterlife for decades was a bit too much. It felt like a stretch, even in the two worlds the book had created, as the premise which was set up is that the people remain there while they forget THEMSELVES, not their lives and other people in their lives. The fact that her mum kept saying things like "don't leave me" just didn't work. It MAY be a book to give to a child who has lost their friend as a way to help them with the acceptance of the loss (although it may also NOT help, as the themes are really unsettling and it verges into territory which would contradict certain religious beliefs - so, one parents should read before deciding whether or not it is appropriate for their child), but I wouldn't recommend it generally. This is a very moving story. I read this book to my Year 4 class who got really interested in the story, asked lots of questions and wanted to know more about the two main characters Ember and Ness. This story talks about issues around death, friendship and looks at the main feelings of the main characters. At times the book can be quite sad but very moving and eye opening. I was drawn to this book because of the illustrations - I'm such a fan of Emily Gravett's picture books that I wanted to read this if only for the illustrations! And I wasn't wrong to - they are both very like some of her picture book work in some ways and much more detailed and with an older feel in others, which is as it should be for an older children's book. Her use of both incredibly detailed pencil sketches and bright colour images not only mirrored and matched the storyline but really enhan I was drawn to this book because of the illustrations - I'm such a fan of Emily Gravett's picture books that I wanted to read this if only for the illustrations! Her use of both incredibly detailed pencil sketches and bright colour images not only mirrored and matched the storyline but really enhanced it, adding extra atmosphere and bringing home what was happening. The illustration felt really fresh and modern, whilst retaining a traditional method and style. The girls and Harry felt expressive and real and the cat in particular was (in my mind) a perfect representation of his character in the story. I thought the relationships in the story were one of its strongest points - very believable and easy to relate to, with characters it was easy to warm to. Both the relationship between Ember and her dad, Harry, and her friendship between Ness and Ember were very well depicted, in both the text and illustrations, with little details giving them added depth and credibility. Characters such as the cat and Ms Todd gave the book an extra dimension and the fact that their roles are left obscure and undefined I thought was very clever in giving the reader something to ponder and draw their own conclusions from. However, I would have liked a more definite conclusion to Uncle Graham's role in the story, but that's just me! This is ultimately a story about death - loss, grief, letting go and moving on; I can see it being a great book for a lot of children dealing with these things, with many aspects of death (finding out about it, the funeral, getting on with life) tackled head on, but in a very age-appropriate way. I would say that due to the nature of the story - the mysterious afterworld and the way that works - it would probably be better for slightly more mature readers who'd be able to easily separate the fantasy elements of the story from the more real aspects. However, this is also what makes it a universally good read with a wider appeal. Sensitively written, it takes an incredibly tough, real situation and everyday life and combines it with fantasy to create a story which is at once familiar and otherworldly. For those who are in, or have been in, Ember (or Graham)'s situation coping with loss, there's plenty of subtly delivered advice and comfort; for those who (fortunately) have not had to deal with this, there's a supernatural story firmly rooted in familiar settings, making this ideal for fans of a range of MG fiction - from Lisa Thomson's 'The Light Jar' to Neil Gaiman's 'Coraline', for example. 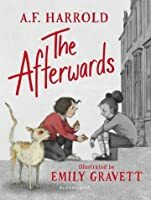 @kidlitexchange #partner - Thank you #kidlitexchange and @bloomsburypublishing for the Advance Reader Copy of @a.f.harrold ‘s THE AFTERWARDS. Opinions are my own. Ember’s loving widowed Dad leaves her with eccentric Uncle Graham the day afterward, who takes her to a strange black-and-white parallel universe behind his garden, where Ness is lonely, sad, and confused. But Graham isn’t l @kidlitexchange #partner - Thank you #kidlitexchange and @bloomsburypublishing for the Advance Reader Copy of @a.f.harrold ‘s THE AFTERWARDS. Opinions are my own. Loved: - Ethnically-diverse cast of characters in the illustrations, but race and religion are never mentioned. The Afterward is black-and-white; and love and loss are bigger and more universal than huamnity’s superficial boxes. - @emily_gravett (who also collaborted with Harrold on THE IMAGINARY) 's gorgeous four-color illustrations add to the creepy vibe. Think Maurice Sendak x Tim Burton. December and Happiness are the best of friends. They laugh, play, imagine, and do almost everything together. But one day when Ember is waiting as usual for Ness to arrive so they can walk to school together, she begins to worry. She soon finds out why Ness didn’t arrive. School without Ness is strange and quiet and sad. So when Ember’s Uncle Graham is waiting for her at the school gates after school, she is happy to go with him instead of walking home alone. The first thing she notices while she December and Happiness are the best of friends. They laugh, play, imagine, and do almost everything together. But one day when Ember is waiting as usual for Ness to arrive so they can walk to school together, she begins to worry. She soon finds out why Ness didn’t arrive. School without Ness is strange and quiet and sad. So when Ember’s Uncle Graham is waiting for her at the school gates after school, she is happy to go with him instead of walking home alone. The first thing she notices while she has afternoon tea, is Uncle Graham’s dog basket. It is empty after Betty died. Uncle Graham loved Betty like a child. Maybe he is sad too? Uncle Graham walks Ember home, but seems to be going around in circles – until they end up somewhere that looks familiar, sort of. Everything is grey, even the sun, and Ember is confused. But Uncle Graham has had a plan all along. This strange grey place is where things go after they die, and Uncle Graham is looking for Betty. Uncle Graham’s plan is a terrible thing, and as Ember gets caught up in it, she also finds a solution to her own sadness and loss. Or does she? Will it work? Should she even risk it? This review has been hidden because it contains spoilers. To view it, click here. Thank you to Bloomsbury Children's Books and NetGalley for access to this ARC. The true winner of this book are the visual aspects. They're clearly well thought out and add a LOT to set the mood of the story. There was one set of pages that were on a different color scheme that definitely hurt my eyes, but I think this particular section would look better in print than on a computer screen. As a book, this is DEFINITELY stylistically similar to Gaiman or Dahl (as is stated in the synopsi Thank you to Bloomsbury Children's Books and NetGalley for access to this ARC. As a book, this is DEFINITELY stylistically similar to Gaiman or Dahl (as is stated in the synopsis). Hilariously enough, I decided that and then saw that's how they were marketing it. This is... dark. Like, very dark. And I think I would really have enjoyed it as a kid, so I don't necessarily think dark is bad. However, it's not really something I would give to a kid to be therapeutic. This is not a book to hand to someone who has recently suffered a loss. Additionally, I'm kind of stuck on what ages this would be for. It's pretty short (about 200 pages) and the fact that it is illustrated would deceive people into thinking it should be recommended for younger children than I could imagine generally being able to handle this level of darkness. Amazon says 8-12 yrs old, I'd say more like 10-14 (obviously dependent on the individual kid). This is a story about a girl, December, whose friend, Happiness, died from a fall from a swing in the park. She feels really sad about it and finds only emptiness inside when she goes to school. But when she finds a way into the afterworld, she is determined to save her friend and bring her back because that's what friends are for. Little did she know that there are dangers to be faced and lessons to learn that will finally bring her feeling of lost to a closure. I really enjoyed this fast paced, middle grade read. It was very exciting and adventurous but also filled with emotions. It was very sad to see how losing someone affects a person. But it was also very moving to see what happens when one moves on. Instead of holding on, feeling resentment and bitterness, one can move on to find peace and healing. I would recommend this read to everyone regardless of age. It is very eye opening and would comfort those who lost someone. I loved super sad books when I was a kid (my mom was apparently a little worried about me, but I just liked reading them because thankfully nothing sad happened in my life so it was my way of releasing those emotions, I think). Anyway, I would have loved this! But, for any child that has gone through the loss of a childhood friend, I do not think this is the book for them. (view spoiler)[ December (Ember) loses her best friend in a freak playground accident, and - as any child would - would do a I loved super sad books when I was a kid (my mom was apparently a little worried about me, but I just liked reading them because thankfully nothing sad happened in my life so it was my way of releasing those emotions, I think). Anyway, I would have loved this! But, for any child that has gone through the loss of a childhood friend, I do not think this is the book for them. This story was one that really touched me unexpectedly. I was moved by the friendship between Ember and Ness, and more so by Ness's sudden death. My heart ached at Ember's confusion and sadness and her attempts at coping with her best friend's demise. Trying to understand how and why. When the story moves on to the other world, the land of the dead, which is illustrated and described as grey, devoid of color or emotions, it gets weird. In a good way. I admired Ember's willingness to help her fri This story was one that really touched me unexpectedly. When the story moves on to the other world, the land of the dead, which is illustrated and described as grey, devoid of color or emotions, it gets weird. In a good way. I admired Ember's willingness to help her friend, to try and get back to the world of the living and everything she was prepared to sacrifice for her. There's a conflict here with being 'selfish'. She's willing to sacrifice herself for her best friend in an act that would be considered hugely unselfish, however, you are willing to abandon your father, who has already lost his wife and you're his only child, and that strikes me as quite 'selfish' of her. I was also a little miffed that her uncle got away with everything. And I was a little confused with the connection between the beginning of the book and the end. I was hoping to see a full circle come to a close. December, or Ember, lives with her father, Harry, but without mum, who passed away. December and her father have a clear, loving relationship - it’s brilliant to see such a strong father in a children’s story. Ember’s world is shaken further when her best friend, Ness (Happiness) dies after an accident. What happens next transcends the real world and what we assume is the afterlife, a monochromatic place where time stands still. Ember finds herself there after her wayward Uncle ‘swaps’ her for h December, or Ember, lives with her father, Harry, but without mum, who passed away. December and her father have a clear, loving relationship - it’s brilliant to see such a strong father in a children’s story. Ember’s world is shaken further when her best friend, Ness (Happiness) dies after an accident. What happens next transcends the real world and what we assume is the afterlife, a monochromatic place where time stands still. Ember finds herself there after her wayward Uncle ‘swaps’ her for his dead dog, but she is able to move between the two worlds with help from Mrs Todd and a mysterious cat (surely Zinzan from The Imaginary). Much like the second world that Ember visits, Harold’s writing moves slowly, thoughtfully as she contemplates what to do - could she harness Uncle Graham’s ability to swap the living for the dead? Can she bring back Ness? After reading The Imaginary, I had high hopes for this book. I attended an evening with A.F and Emily Gravett, prior to reading the book, where Harrold read an extract. It’s easy to say that his writing style is engaging, but meaningful and completely captivating. Whilst elements of this book have a rather eerie feel, it’s more about a girl coming to terms with the death of her friend and the journey of grief she goes on in search of acceptance. Wow this is a heart-wrenching book. I can see how it would be okay for older kids to read to learn about death and how life can still go on after something tragic has happened. But it is still a hard one to get through. I think the illustrations really help the story a long and show the contrast of the two worlds. Harrold is an amazing author and this is a great story to have out in the world, just not for the very young. This is a tender story about friendship and loss. It is a dark fantasy that would not be appropriate for younger readers. Ember and Ness are best friends, but when Ness dies, Ember finds her way into the Afterworld. Ember decides she cannot leave the Afterworld until she finds a way to bring Ness back. Emily Gravett has found a unique way to look at death and grieving. The illustrations are original and endearing. What happens when one refuses to accept their loved one has died? December discovers maybe she doesn’t have to accept her best friend Happiness’s death in this poignant illustrated middle grade novel. Creepy and beautiful. The writing begs to be read aloud. I’m not sure the illustrations match the mood of the story for me and I don’t think this will have much of an audience in my middle school library, unfortunately. I do recommend for purchase in elementary libraries.